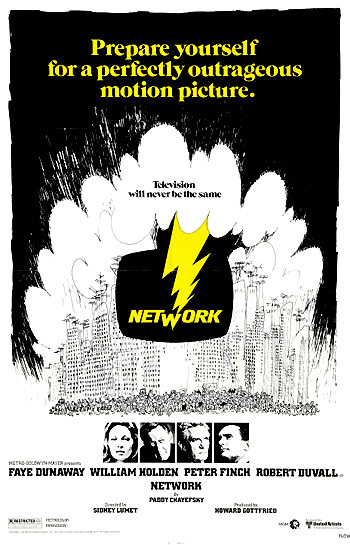 Network (1976) is director Sidney Lumet's brilliant, pitch-black criticism of the hollow, lurid wasteland of television journalism where entertainment value and short-term ratings were more crucial than quality. Paddy Chayefsky's black, prophetic, satirical commentary/criticism of corporate evil (in the tabloid-tainted television industry) is an insightful indictment of the rabid desire for ratings by the media - eerily prescient even for the present age. Indignation toward the network executives by an unbalanced news-anchorman (Finch) ("I'm as mad as hell, and I'm not gonna take this anymore") is manipulated by ruthless VP programming boss (Dunaway) for further ratings. "Television will never be the same." The other six nominations were for Best Actor (William Holden), Best Cinematography (Owen Roizman), Best Director (Lumet's third directorial nomination without a win), Best Film Editing, Best Supporting Actor (Ned Beatty), and Best Picture. Max: You'd get a hell of a rating, I'll guarantee you that. A fifty share easy...We could make a series out of it. Suicide of the Week. Oh hell, why limit ourselves? Execution of the Week. Howard: Terrorist of the Week. Max: I love it! Suicides, assassinations, mad bombers, Mafia hitmen, automobile smash-ups. The Death Hour! A great Sunday night show for the whole family. We'll wipe f--kin' Disney right off the air. Brief shots compare the buildings of "Television Row," where the four television networks have skyscraper glass/marble buildings reaching to the sky. Seemingly routine scenes of the bustling newsroom and a run-down meeting for the evening's schedule on UBS-TV are shown interspersed underneath the film's credits. Howard is made-up in a small network-news make-up room before he takes a sip of booze and proceeds to the studio for the seven o'clock news. During the beginning of the broadcast, the network's Washington correspondent makes a follow-up report on the attempted assassination of President Ford in San Francisco on the previous day. When Beale begins the evening news show, he tells his viewers, off from his script, that he has been fired and will commit suicide during his final broadcast a week later. Ladies and gentlemen, I would like at this moment to announce that I will be retiring from this program in two weeks' time because of poor ratings. Since this show was the only thing I had going for me in my life, I have decided to kill myself. I'm gonna blow my brains out right on this program a week from today. Tune in next Tuesday. That should give the public relations people a week to promote the show. We ought to get a hell of a rating out of that - a fifty share, easy. Production assistants and the director are bewildered and can scarcely believe what they have heard. Before the next segment, a floor manager and associate producer struggle to pull Howard away from his reporting desk. As he holds onto the desk, the screen projects the confusing bedlam and chaos, and then abruptly cuts to a standby screen: "VIDEO DIFFICULTIES are TEMPORARY - Please do not adjust your set." Frank Hackett (Robert Duvall), the Executive Senior VP of the network, who has been summoned from a dinner party (and is still in his tuxedo) races through the UBS offices to deal with the embarrassing crisis for the network hierarchy - the network's downstairs lobby is swarming with every TV station and wire service in the city, and the station's phones are clogged with viewers complaining about the foul language. In an executive office, Hackett confronts Beale on a couch: "You're off the air as of now." The network executives view how Beale's performance was the opening story on other television shows. Max Schumacher explains how UBS will handle the crisis: "Holloway's gonna make a brief statement at the end of the show that Howard's been under great personal stress, et cetera." Hackett explodes with anger at Schumacher: "I've had it up to here with your cruddy division and its annual thirty-three million dollar deficit." (on screen) The Communist Party believes that the most pressing political necessity today is the consolidation of the revolutionary, radical, and democratic movements into a United Front. I'd just like to come on, make some brief farewell statement and then turn the show over to Jack Snowden. I have eleven years at this network, Max. I have some standing in the industry. I just don't want to go out like a clown. It'll be simple, dignified. Bosch: A series about a bunch of, uh, bank-robbing guerrillas? Schlesinger: What are we gonna call it - the Mao Tse-Tung Hour? Diana: Why not? They've got 'Strike Force', 'Task Force', 'SWAT'. Why not Che Guevara and his own little 'Mod Squad'. Look, I sent you all a concept analysis report yesterday. Did any of you read it? Well, in a nutshell, it said, 'The American people are turning sullen. They've been clobbered on all sides by Vietnam, Watergate, the inflation, the depression. They've turned off, shot up, and they've f--ked themselves limp and nothing helps.' So this concept analysis report concludes, 'The American people want somebody to articulate their rage for them.' I've been telling you people since I took this job six months ago that I want angry shows. I don't want conventional programming on this network. I want counter-culture. I want anti-establishment. (She shuts her door) I don't want to play butch boss with you people. But when I took over this department, it had the worst programming record in television history. This network hasn't one show in the top 20. This network is an industry joke. And we better start putting together one winner for next September. I want a show developed, based on the activities of a terrorist group. 'Joseph Stalin and his Merry Band of Bolsheviks.' I want ideas from you people. That is what you're paid for. And, by the way, the next time I send an audience research report around, you'd all better read it or I'll sack the f--king lot of you, is that clear? At the television network's stockholders meeting in a banquet room within the New York Hilton, Frank Hackett makes an annual report to the seated audience, and submits a plan "for the coordination of the main profit centers, and with the specific intention of making each division more responsive to management." He singles out the division which produces "the lowest rate of return" - the News Division - "with its 98 million dollar budget and its average annual deficit of 32 million. I know that historically, news divisions are expected to lose money. But to our minds, this philosophy is a wanton fiscal affront to be resolutely resisted. The new plan calls for local news to be transferred to Owned Stations Divisions, News-Radio would be transferred to the USB Radio Division, and in effect, the News Division would be reduced from an independent division to a department accountable to network." After the meeting, Max Schumacher is enraged and feels "publicly humiliated" - he complains to Edward Ruddy (William Prince), Chairman of the Board. Good evening. Today is Wednesday, September the twenty-fourth, and this is my last broadcast. Yesterday, I announced on this program that I was going to commit public suicide, admittedly, an act of madness. Well, I'll tell you what happened. I just ran out of bulls--t...Bulls--t is all the reasons we give for living, and if we can't think up any reasons of our own, we always have the God bulls--t...We don't know why the hell we're going through all this pointless pain, humiliation and decay, so there better be someone somewhere who does know. That's the God bulls--t. If you don't like the God bulls--t, how about the man bulls--t? Man is a noble creature that can order his own world. Who needs God? Well, if there's anybody out there that can look around this demented slaughterhouse of a world we live in and tell me that man is a noble creature, believe me, that man is full of bulls--t...I don't have any kids, and I was married for thirty-three years of shrill, shrieking fraud. So I don't have any bulls--t left. I just ran out of it, you see? In the offices of top management later that evening, Edward Ruddy berates Max for his responsibility for the evening's newcast - a "colossally stupid prank...It was unconscionable. There doesn't seem to be anything more to say." Fighting for his own survival, Schumacher is concerned about a mega-conglomerate named C. C. and A. and its encroachment over the UBS Systems and the network. The corporate take-over is controlled by "CCA's hatchet man" Frank Hackett, symbolic of the complete collapse of news standards that he grew up with since the days of Edward R. Murrow. But Ruddy cannot tolerate Max's complicity "in a shocking and disgraceful episode. Your position is no longer tenable regardless of how management is restructured. I will expect your resignation at ten o'clock tomorrow morning..." Max is summarily fired from the News Division. Howard Beale, meanwhile, has become the darling of the media after his triumphant return, and he speaks behind a crushing tide of cameras following his last broadcast: "Every day, five days a week, for fifteen years, I've been sitting behind that desk, the dispassionate pundit, reporting with seemly detachment the daily parade of lunacies that constitute the news and just once I wanted to say what I really felt." His interview is intently watched by Diana from her apartment as she dispassionately sits naked with a young stud named Arthur Zangwill (Mitchell Jason). The Arabs have decided to jack up the price of oil another twenty per cent, the CIA has been caught opening Senator Humphrey's mail, there's a civil war in Angola, another one in Beirut, New York City's still facing default, they've finally caught up with Patricia Hearst and - the whole front page of the Daily News is Howard Beale. Diana: We just increased our audience by twenty or thirty million people in one night. Now, you're not gonna get something like this dumped in your lap for the rest of your days, and you can't just piss it away. Howard Beale got up there last night and said what every American feels, that he's tired of all the bulls--t. He's articulating the popular rage. I want that show, Frank. I can turn that show into the biggest smash on television. Hackett: What do you mean, you want that show? It's a news show. It's not your department. Diana: I see Howard Beale as a latter-day prophet, a magnificent messianic figure, inveighing against the hypocrisies of our times, a strip Savonarola, Monday through Friday. I tell you, Frank, that could just go through the roof. And I'm talking about a six dollar cost per thousand show! I'm talking about a hundred, a hundred thirty thousand dollar minutes! Do you want to figure out the revenues of a strip show that sells for a hundred thousand bucks a minute? One show like that could pull this whole network right out of the hole! Now, Frank, it's being handed to us on a plate. Let's not blow it!